Packington (Pakyngton), John, of the Welsh Council, 398, 447, 510, 690, 1021:g. 282 (7, 28, 345), 733 (63), 942 (39, 40). -, -, letters from, 447, 510. -, (Pakyngton), John, g. 831 (47b). Paderborn (Padebourne), in Westphalia, meeting of the elector of Saxony and duke of Cleves at, 242, 302, 389, 519. Padiham, Lanc., g. 611 (13). Padula (Paluda), in Naples, marquesana of, 356. Padworth, Berks, g. 831 (1). Page, Edw., 609 (p. 275). -, (Padge), Sir Richard, lieutenant of the Pensioners, 10, 14 (p. 5 bis):p. 540. -, Robt., g. 942 (69). -, Wm. 268 ii., 609 (p. 275). Paget (Pachett, Patchett), William, secretary to Queen Katharine Howard, clerk of the Privy Council (10 Aug. 1540), 138, 642 (1, 2), 692, 728, 830 (p. 401), 966, 1021:g. 831 (47b). -, -, handwriting of, 728, 830 (p. 401). -, (Pachett), Rose, 840.p. 548. Pagham (Pegham), Suss., 498 (37):g. 611 (45). Pains Castle, in Wales, g. 282 (28). Painswick (Paynestwyke, Paneswyke), Glouc., 751:g. 733 (28), 1027 (3). -, letters dated at, 406, 408. Painswick Strode, Glouc., g. 1027 (3). Pakenham, Suff., p. 562:g. 436 (31). Pakye, John, p. 548 bis. Palace, auditors of the. See under Rome. Palatine of the Rhine, conference of the counts (electores Rhenanos), 589, 666. Palatine of the Rhine, Lewis count, Elector, duke of Bavaria, 40, 145 (p. 55), 170, 233, 243, 337, 596, 666, 781 (2), 797, 814, 837 (p. 414), 842. -, -, reported death of, 337. Palatine of the Rhine, Frederic Count, brother of the Elector, duke of Bavaria (Duke Frederic), 145 (p. 55), 170, 195, 233, 337, 438, 530 (p. 237), 666, 870. -, -, servant of, in England, 438. Palatine of the Rhine, Dorothy countess, wife of the preceding, eldest daughter of Christiern II. of Denmark, and sister of Christina duchess of Milan, 396, 530 (p. 237), 666 (p. 316), 870. -, -, letter to, 396. Palatine of the Rhine, Otto Count, duke of Bavaria, nephew of the Elector Palatine, 170, 666, 797. 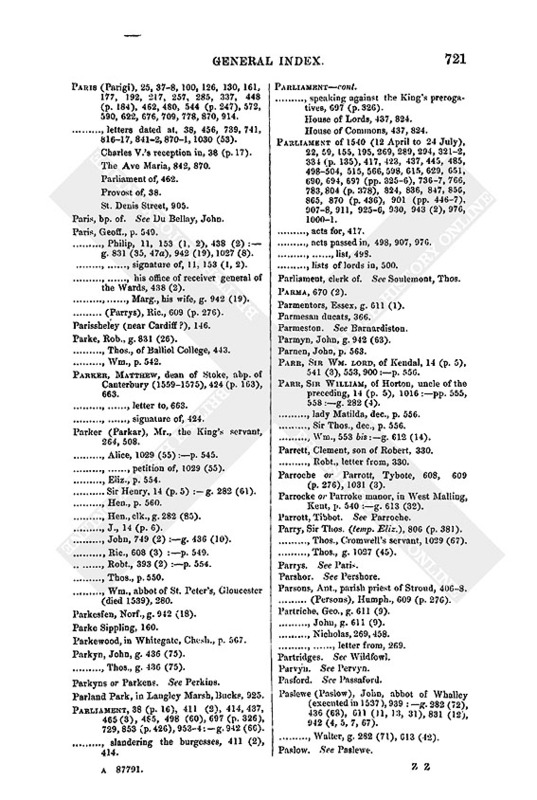 Palatine of the Rhine, Philip Count (Duke Philip), nephew of the Elector, brother of the preceding, duke of Bavaria (Bavar), 14 (p. 5), 18 (p. 8), 23, 40, 68, 76, 116, 123, 155, 16970, 177, 179 (Duke George), 187, 189, 222, 243, 289 (p. 120), 304 (p. 123), 334, 4857, 560 (? ), 642 (1, 2), 666, 797, 889:App. 6, 7:g. 144 (14). -, -, letters from, 170:App. 6, 7. -, -, conditions for his marriage with Princess Mary, 666. -, -, his secretary in England, 334. Palatine of the Rhine, Wolfgang count, brother of the Elector, 797, 842, 889n. Palavicino (Palvesyn), Battista, friar, of Bologna, 842. Palfreman, Robt., g. 942 (99). Pallant (Pallandus), Elbertus, marshal of Cleves (in 1535), 861 (2 pp. 4323). -, the elder, of Bredbent, in the train of Anne of Cleves, 80. -, the younger, knight of St. John or of the Sepulchre, in the train of Anne of Cleves, 80, 850 (10), 970. -, lady, in the train of Anne of Cleves, 80. Palmer (Paulmer), Sir Thomas, knight porter of Calais, 14, 35, 37, 207, 2378, 268, 270, 295, 471, 608 (1, 3, 4 ii. ), 609 (p. 276), 728, 853 (p. 436), 918, 996, 1014, 1029 (58), 1030 (21, 27, 35). -, -, letters from, 207, 237. -, -, letter to, 238. -, -, signature of, 268, 918. Palmer, Mr., King's servant, 264. -, , of Gloucester, one of the Pensioners, 14 (p. 5). -, (Pawmer), old Mr., of Buckinghamshire, 1030 (31). -, young Mr., at Calais, 1030 (31). -, Henry, spear of Calais, bailiff of Guisnes and keeper of the forest there, 261, 435, 608 (3 bis), 609 (p. 276):g. 282 (107). -, -, letter from, 435. -, J., 14 (p. 6). -, (Pawmer), John, 498 iii. c. 63:p. 548:g. 831 (47b). -, Ric., p. 561:g. 942 (11, 39, 115). -, T., one of the Pensioners, 14 (p. 5). Palsgrave, John, a member of Convocation, signature of, 861. Pampisford (Pawnesford), Camb., g. 144 (10). Pan (Panne), near Newport, I. of Wight, g. 144 (12). Pandolfe, Sieur. See Stuffa, P. de. Panell, Ric., g. 942 (50). Panfield, Essex, g. 942 (87). Panton, Linc., g. 942 (118). Panworth (Panneworth) Hall, near Ashill, Norf., g. 436 (40), 611 (10). Papplewick, (Paplewyke), Notts, g. 733 (66). Pardon, General (of 1540), 498 (p. 217), 847, 890, 926. -, -, Act of, 498 (p. 217). Pardons from Rome, 37, 714. Pardons for felony, murder, &c., g. 144 (6), 282 (13, 18, 2831, 378, 467, 75, 1212, 126), 436 (17, 27), 611 (29), 613 (11, 26, 34), 733 (15, 17, 21, 56, 59), 942 (37, 79, 80). Paris (Parigi), 25, 378, 100, 126, 130, 161, 177, 192, 217, 257, 285, 337, 448 (p. 184), 462, 480, 544 (p. 247), 572, 590, 622, 676, 709, 778, 870, 914. -, letters dated at, 38, 456, 739, 741, 81617, 8412, 8701, 1030 (53). -, Charles V.'s reception in, 38 (p. 17). -, The Ave Maria, 842, 870. -, St. Denis Street, 905. Paris, bp. of. See Du Bellay, John. -, Philip, 11, 153 (1, 2), 438 (2):g. 831 (35, 47a), 942 (19), 1027 (8). -, -, signature of, 11, 153 (1, 2). -, -, his office of receiver general of the Wards, 438 (2). -, -, Marg., his wife, g. 942 (19). -, (Parrys), Ric., 609 (p. 276). Parke, Rob., g. 831 (26). -, Thos., of Balliol College, 443. Parker, Matthew, dean of Stoke, abp. of Canterbury (15591575), 424 (p. 163), 663. -, -, letter to, 663. -, -, signature of, 424. Parker (Parkar), Mr., the King's servant, 264, 508. -, Alice, 1029 (55):p. 545. -, -, petition of, 1029 (55). -, Sir Henry, 14 (p. 5):g. 282 (61). -, Hen., clk., g. 282 (85). -, John, 749 (2):g. 436 (10). -, Ric., 608 (3):p. 549. -, Robt., 393 (2):p. 554. -, Wm., abbot of St. Peter's, Gloucester (died 1539), 280. Parkesfen, Norf., g. 942 (18). Parkewood, in Whitegate, Chesh., p. 567. Parkyn, John, g. 436 (75). -, Thos., g. 436 (75). Parkyns or Parkens. See Perkins. Parland Park, in Langley Marsh, Bucks, 925. Parliament, 38 (p. 16), 411 (2), 414, 437, 465 (3), 485, 498 (60), 697 (p. 326), 729, 853 (p. 426), 9534:g. 942 (66). -, slandering the burgesses, 411 (2), 414. -, speaking against the King's prerogatives, 697 (p. 326). -, House of Lords, 437, 824. -, House of Commons, 437, 824. Parliament of 1540 (12 April to 24 July), 22, 59, 155, 195, 269, 289, 294, 3212, 334 (p. 135), 417, 423, 437, 445, 485, 498504, 515, 566, 598, 615, 629, 651, 690, 694, 697 (pp. 3256), 7367, 766, 783, 804 (p. 378), 824, 836, 847, 856, 865, 870 (p. 436), 901 (pp. 4467), 9078, 911, 9256, 930, 943 (2), 976, 10001. -, acts passed in, 498, 907, 976. 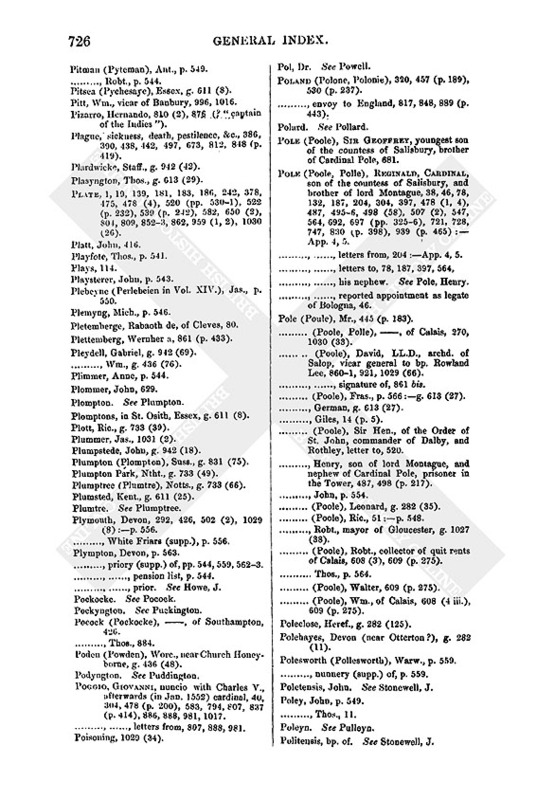 -, lists of lords in, 500. Parliament, clerk of. See Soulemont, Thos. Parmentors, Essex, g. 611 (1). Parmyn, John, g. 942 (63). Parr, Sir Wm. lord, of Kendal, 14 (p. 5), 541 (3), 553, 900:p. 556. Parr, Sir William, of Horton, uncle of the preceding, 14 (p. 5), 1016:pp. 555, 558:g. 282 (4). -, lady Matilda, dec., p. 556. -, Sir Thos., dec., p. 556. -, Wm., 553 bis:g. 612 (14). Parrett, Clement, son of Robert, 330. -, Robt., letter from, 330. Parroche or Parrott, Tybote, 608, 609 (p. 276), 1031 (3). Parrocke or Parroke manor, in West Malling, Kent, p. 540:g. 613 (32). Parry, Sir Thos. (temp. Eliz. ), 806 (p. 381). -, Thos., Cromwell's servant, 1029 (67). -, Thos., g. 1027 (45). Parsons, Ant., parish priest of Stroud, 4068. -, (Persons), Humph., 609 (p. 276). Partriche, Geo., g. 611 (9). -, John, g. 611 (9). -, -, letter from, 269. Paslewe (Paslow), John, abbot of Whalley (executed in 1537), 939:g. 282 (72), 436 (68), 611 (11, 13, 31), 831 (12), 942 (4, 5, 7, 67). -, Walter, g. 282 (71), 613 (42). Pasmer, John, g. 282 (33), 942 (75). Passaford (Pasford), Devon, g. 282 (11). Passau, in Germany, bp. of, 797. Passion, the, a picture, 1029 (6). -, Thos., of the Privy Chamber, 14 (p. 5), 445, 900:g. 613 (30), 942 (122). -, Sir Wm., 14:g. 282 (6). Patching (Pachyng), Suss., g. 733 (55). Pate (Pates), Richard, archd. of Lincoln, nephew of Bishop Lougland, ambassador to Charles V. (14 April 1540), 38, 322, 4689, 481, 508 (p. 227), 530, 566, 5823, 6214, 662, 665, 673, 720, 765, 7934, 796, 803, 81113, 8367, 8478, 8635, 8768, 886, 8889, 9312, 1017. -, -, letters from, 5823, 6214, 665, 673, 720 ii., 7934, 796, 81113, 837, 8634, 8768, 886, 889, 9312. -, -, letters to, 662, 836, 865. -, -, passport for, 481. Pathnowe, Thos., g. 436 (18). Patience (Pacyens), Wm., 69 (2):p. 546. Patras, in Greece, 1030 (18 p. 530). Patrixbourne (Patrykesborne), Kent, g. 436 (45). Patteston alias Pytteston, Devon, near Harpford, g. 282 (11). Pattingham (Patengham), Staff., g. 611 (26). Pattishall (Patteshull), Ntht., g. 942 (99, 109). Paul III., Pope (the Bishop. Alexander Farnese. For references to his ecclesiastical office, see Pope), personal notices, 133, 204, 344 (p. 138), 356, 456, 478 (1, 4), 495 iii., iv., 496, 564, 591, 670 (2), 704, 712, 797, 906, 1020:App. 2, 4. -, political references, 5, 7, 38 (p. 16), 68, 104, 134, 136 ii., 187, 239, 248 (pp. 901), 276, 310 (p. 126), 320, 332, 356, 368, 388, 401, 448 (p. 184), 449, 462, 478, 480, 512, 543 (p. 246), 548, 5813, 591, 665, 666 (p. 316), 670, 712, 720, 742, 759, 762, 768, 778, 7934, 808, 812, 814, 825, 830 (p. 399), 837, 842, 848, 854, 861 (2), 879, 889, 892, 9056, 909, 911, 9324, 961, 1017, 1024. -, briefs (or letters) from, 41, 669, 820. -, letters to, 5, 7, 40, 130, 148, 1789, 232, 244, 260, 304, 637, 640, 753, 933, 945, 973. -, his niece. See Farnese, Vittoria. Paule, Alice, g. 436 (10). Paulet, Sir Wm. See St. John, lord. Paulett or Paulet, Geo., g. 831 (47a), 942 (14). -, (Pallett), George, brother of lord St. John, commissioner in Ireland (in 15378), 83. -, (Poullet), Sir Hugh, 14 (p. 5), 391, 553:g. 282 (5, 102). -, -, letter to, 391. -, (Pollet), John, 14 (p. 6):g. 282 (5), 831 (47a), 942 (14). -, (Poulet), Ric., a receiver of Augmentations, 19, 24, 139. -, -, signature of, 19, 24. -, (Poulet), Ric., g. 831 (1, 47a), 942 (14). -, -, Eliz., his wife, g. 831 (1). Paulo, Signor Giovanni, a Roman in the French service, 670. Pauls, the two (Paul Sadolet and ), 78. Paulus, a friend of Melancthon, 679. Paur, Chr., brother of Hans, 2723. -, (Pawer), Hans, of Antwerp and Nuremberg, 2723, 390. -, -, letters from, 2723. Pawne, Wm., g. 282 (107). Paxley (Pouxly), Ntht., g. 942 (118). Payhembury (Pahembury), Devon, p. 565. -, Andrew, g. 831 (71). -, John, p. 543 bis. -, Thos., g. 1027 (38). Paynell, Mr., bailiff of Boston, 695. Payton or Peyton, Chr., p. 560. -, -, Joan, his wife, p. 560. -, Edm., 609 (p. 276). -, Edw., customer of Calais, 460, 608 (3). -, (Paiton), Edw., 42:p. 542. -, Sir Robt., 14 (p. 6):g. 282 (6), 831 (29). Peace negociations between France and the Emperor, 134, 169, 239. Peachey or Pechy (Peche), Eliz., widow of Sir John, p. 541. -, (Peche), Sir John, deputy of Calais (15 May 1519 to 28 Nov. 1520), p. 541:g. 942 (10). Peckham, East- (Estpekham), Kent, g. 282 (84), 613 (32). Peckham (Pekham), Great-, Kent, 806 (p. 380). Pecoke or Pecocke, Mr., 1029 (56). -, Alice, pp. 543, 553. Pecy, earl of (for Essex), 567. Peers, creation of, 541 (3). Peers, Wm., 609 (p. 277). Peigne, John, g. 436 (89). Peke or Pecke, John, p. 562:g. 611 (39). 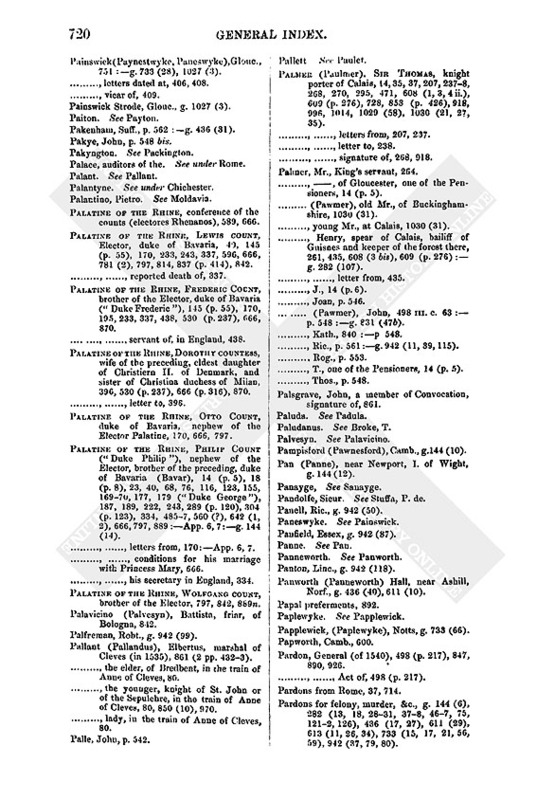 Pekham (Peckham), Edmund, cofferer of the Household (Mr. Cofferer), 138, 498 (33), 599, 642 (1, 2), 996:p. 555:g. 831 (47b). Pekham, James, 498 iii. c. 72. -, Lucy, 498 iii. c. 72. -, Reynold, 498 iii. c. 72. Pekk, John, g. 282 (21). Peldon, Essex, g. 611 (8 p. 285). Pele, John, g. 831 (12). Pelham, Ant., of Calais, 608 (4 iii.). -, Ant., 14 (p. 6). -, Eliz., g. 733 (52). -, John, dec., g. 733 (52). -, (Pelland), Ric., soldier of Calais, 460, 471, 473n, 609 (p. 275), 997. -, W., one of the Pensioners, 14 (p. 5). Pell, Alice, g. 831 (54). -, Thos., g. 831 (64). Pelles or Pellys, Martin, 830 (p. 399). Pellican, Conrad, 269, 383, 458, 1025. 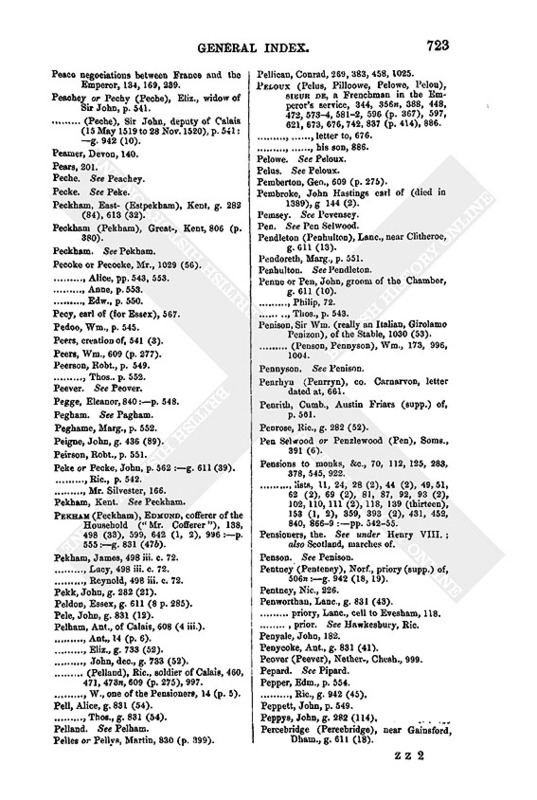 Peloux (Pelus, Pilloowe, Pelowe, Pelou), sieur de, a Frenchman in the Emperor's service, 344, 356n, 388, 448, 472, 5734, 5812, 596 (p. 367), 597, 621, 673, 676, 742, 837 (p. 414), 886. -, -, letter to, 676. -, -, his son, 886. Pemberton, Geo., 609 (p. 275). Pembroke, John Hastings earl of (died in 1389), g 144 (2). Pendleton (Penhulton), Lanc., near Clitheroe, g. 611 (13). Penne or Pen, John, groom of the Chamber, g. 611 (10). Penison, Sir Wm. (really an Italian, Girolamo Penizon), of the Stable, 1030 (53). -, (Penson, Pennyson), Wm., 173, 996, 1004. Penrhyn (Penrryn), co. Carnarvon, letter dated at, 661. Penrith, Cumb., Austin Friars (supp.) of, p. 561. Penrose, Ric., g. 282 (52). Pen Selwood or Penzlewood (Pen), Soms., 391 (6). Pensions to monks, &c., 70, 112, 125, 283, 378, 545, 922. -, lists, 11, 24, 28 (2), 44 (2), 49, 51, 62 (2), 69 (2), 81, 87, 92, 93 (2), 102, 110, 111 (2), 118, 139 (thirteen), 153 (1, 2), 359, 393 (2), 431, 452, 840, 8669:pp. 54255. Pensioners, the. See under Henry VIII. ; also Scotland, marches of. Pentney (Penteney), Norf., priory (supp.) of, 506n:g. 942 (18, 19). Penworthan, Lanc., g. 831 (43). -, priory, Lanc., cell to Evesham, 118. -, prior. See Hawkesbury, Ric. Penycoke, Ant., g. 831 (41). Peover (Peever), Nether-, Chesh., 999. -, Ric., g. 942 (45). Peppys, John, g. 282 (114). Percebridge (Pereebridge), near Gainsford, Dham., g. 611 (18). Percival (Percevall), Joan, p. 543. -, (Peyrcy), Eliz., p. 553. -, (Persee), Jane, 1029 (57). -, (Percye), Roger, p. 544. -, Sir Thos. (executed in 1537), 939. Pereman, John, 689 (3, 4, 5):p. 544. Perez (Peris), Mayo, a Spaniard, 9. Perkins (Parkyns, Parkens), Humph., S.T.P., 861:g. 942 (73). Permenger, Ric., 498 iii. c. 68. Peronne, in France, 543 (p. 245). Perpignan, the treating at (in Jan. 1538), 320, 332. Persall, John, g. 942 (40). Pershore (Parshor), Worc., abbey of, 92:pp. 548, 566. -, -, abbot. See Stonewell, J. -, -, pension list, 92:p. 548. Persia (Perse), 38 (p. 15). -, king of. See Sophi. Person, Geoff., g. 942 (86). Pertenhall, Beds, g. 831 (16). Perugia (Perowse, Peruse), and the Perusians (mutinies against the Pope, etc. ), 448 (p. 184), 512, 548, 5813, 591, 670, 712, 720, 762, 778, 794, 808, 837, 842. -, the Pope's captain against. See Savello, Gio. Batt. Pervin (Parvyn), Heref., near Leominster, g. 282 (63). -, Thos., English merchant in Spain, 281, 859, 977. -, -, letter from, 281. Peryent, John, g. 282 (61), 1027 (9). -, John, abbot of Tavistock, p. 542. Pescara (Piscaria), Vittoria Colonna marchioness of, 78. Peterborough, Ntht., commission of peace for, g. 282 (68). -, abbey (supp.) of, p. 549:g. 282 (678). -, -, abbot. See Chambers, J. -, -, pension list, p. 549. Peterson, Wm., parson of Boninges, commissary of abp. Warham at Calais (executed 10 April 1540), 37, 217. -, -, examination of, 37. -, -, signature of, 37. -, Wm., 259, 420, 458, 734. Petherton, North- (Northepetherton), Soms., p. 557. Petite, Ciriac, p. 567 bis. Petley, Wm., 609 (p. 276). Peto (Petow), Father Wm., Observant Friar, attainted in 1539, an exile, afterwards (1557) cardinal, 939 (p. 465). Petre (Peter), William, LL.D., 14 (p. 5), 60, 69 (1, 2), 70, 1389, 359 (1, 2), 378, 393, 438, 474, 743, 758, 821, 860 (p. 430), 861 (1, 2):p. 559. -, -, signature of, 69 (1, 2), 359 (2), 393, 474, 861. Pett, Suss., g. 942 (17). Petworth, Suss., 498 (37):g. 733 (52). -, -, letter dated at, 326. -, -, annexation to the honor (Act), 498 (37). Petyfen, Arthur, g. 613 (34). -, Emelina, g. 613 (34). Petypole, in Delamere Forest, Chesh., p. 563. Pevensey (Pemsey), Suss., 498 (37). Pewmar, Devon, 498 iii. c. 79. Pewsham (Pevesham), Wilts, near Chippenham, g. 144 (2 p. 52). Pexall (Pexsale), Ric., 14 (p. 6). Peyrs, Robt., g. 611 (8). Philcockes, Hugh 609 (p. 275). Philip, prince of Spain or of Castille, son of Charles V., afterwards king Philip II., 332, 457 (p. 189), 508 (p. 227), 543 (pp. 2445), 597, 810. Philip, Duke. See Palatine of the Rhine. Philip, Mrs. See Basset, P.
Philip (Phylypp), Geoff., g. 733 (9). -, (Phillippe), Hugh, p. 548. -, (Philippe), John, p. 549. -, (Phylypp), Walter. See Philips. Philips (Phyllyps), Geo., 92:p. 548. -, Harry, Tynedale's betrayer, an exile, (Mr. Wriothesley's jewel), 188, 203, 449. -, (Phyllepps), John, 609 (p. 275):p. 546. -, (Phelyp, Phelyppes, Phylleppes, Phyllyppes), Ric., 95:p. 543:g. 282 (5, 9), 831 (34), 942 (13). -, -, signature of, 95. -, (Phelippes), Robt., g. 613 (17). -, (Phylypp), Walter, prior and dean of Rochester, 474. 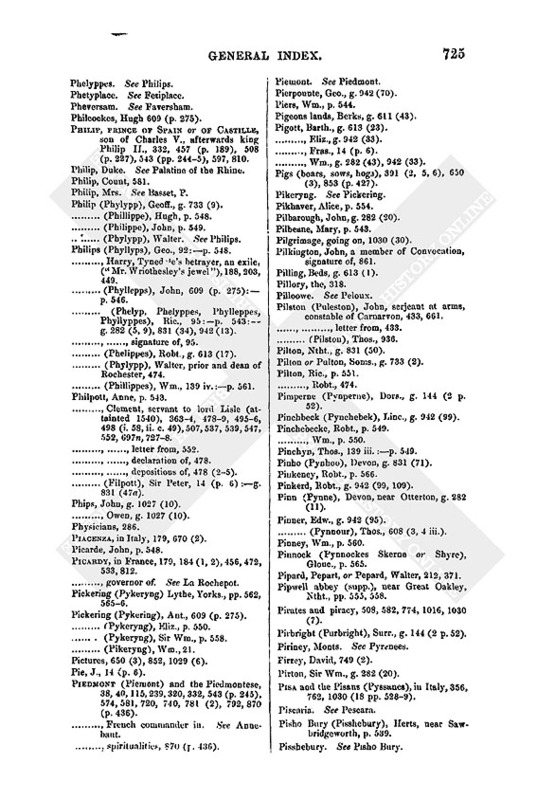 -, (Phillippes), Wm., 139 iv.:p. 561. -, Clement, servant to lord Lisle (attainted 1540), 3634, 4789, 4956, 498 (i. 58, ii. c. 49), 507, 537, 539, 547, 562, 697n, 7278. -, -, letter from, 552. -, -, declaration of, 478. -, -, depositions of, 478 (25). -, (Filpott), Sir Peter, 14 (p. 6).g. 831 (47a). Phips, John, g. 1027 (10). -, Owen, g. 1027 (10). Piacenza, in Italy, 179, 670 (2). Picardy, in France, 179, 184 (1, 2), 456, 472, 533, 812. -, governor of. See La Rochepot. Pickering (Pykeryng) Lythe, Yorks., pp. 562, 5656. Pickering (Pykering), Ant., 609 (p. 275). -, (Pykeryng), Eliz., p. 550. -, (Pykeryng), Sir Wm., p. 558. Pictures, 650 (3), 852, 1029 (6). Pie, J., 14 (p. 6). Piedmont (Piemont) and the Piedmontese, 38, 40, 115, 239, 320, 332, 543 (p. 245), 574, 581, 720, 740, 781 (2), 792, 870 (p. 436). -, French commander in. See Annebaut. -, spiritualities, 870 (p. 436). Pierpounte, Geo., g. 942 (70). Pigeons lands, Berks, g. 611 (43). Pigott, Barth., g. 613 (23). -, Eliz., g. 942 (33). -, Fras., 14 (p. 6). -, Wm., g. 282 (43), 942 (33). Pigs (boars, sows, hogs), 391 (2, 5, 6), 650 (3), 853 (p. 427). Pilbarough, John, g. 282 (20). Pilgrimage, going on, 1030 (30). Pilkington, John, a member of Convocation, signature of, 861. Pilling, Beds, g. 613 (1). Pilston (Puleston), John, serjeant at arms, constable of Carnarvon, 433, 661. Pilton, Ntht., g. 831 (50). Pilton or Pulton, Soms., g. 733 (2). Pimperne (Pynperne), Dors., g. 144 (2 p. 52). Pinchbeck (Pynchebek), Linc., g. 942 (99). Pinchyn, Thos., 139 iii.:p. 549. Pinho (Pynhoo), Devon, g. 831 (71). Pinkerd, Robt., g. 942 (99, 109). Pinn (Pynne), Devon, near Otterton, g. 282 (11). Pinner, Edw., g. 942 (95). -, (Pynnour), Thos., 608 (3, 4 iii.). Pinnock (Pynnockes Skerne or Shyre), Glouc., p. 565. Pipard, Pepart, or Pepard, Walter, 212, 371. Pipwell abbey (supp. ), near Great Oakley, Ntht., pp. 555, 558. Pirates and piracy, 508, 582, 774, 1016, 1030 (7). Pirbright (Purbright), Surr., g. 144 (2 p. 52). Pirton, Sir Wm., g. 282 (20). Pisa and the Pisans (Pyssanes), in Italy, 356, 762, 1030 (18 pp. 5289). Pisho Bury (Pisshebury), Herts, near Sawbridgeworth, p. 539. Pitman (Pyteman), Ant., p. 549. Pitsea (Pychesaye), Essex, g. 611 (8). Pitt, Wm., vicar of Banbury, 996, 1016. Pizarro, Hernando, 810 (2), 876 (? captain of the Indies). Plague, sickness, death, pestilence, &c., 386, 390, 438, 442, 497, 673, 812, 848 (p. 419). Plardwicke, Staff., g. 942 (42). Plasyngton, Thos., g. 613 (29). Plate, 1, 19, 139, 181, 183, 186, 242, 378, 475, 478 (4), 520 (pp. 5301), 522 (p. 232), 539 (p. 242), 582, 650 (2), 804, 809, 8523, 862, 959 (1, 2), 1030 (26). Plebeyne (Perlebeien in Vol. XIV. ), Jas., p. 550. Pletemberge, Rabaoth de, of Cleves, 80. Plettemberg, Wernher a, 861 (p. 433). Pleydell, Gabriel, g. 942 (69). -, Wm., g. 436 (76). Plomptons, in St. Osith, Essex, g. 611 (8). Plott, Ric., g. 733 (39). Plumpstede, John, g. 942 (18). Plumpton (Plompton), Suss., g. 831 (75). Plumpton Park, Ntht., g. 733 (49). Plumptree (Plumtre), Notts., g. 733 (66). Plumsted, Kent., g. 611 (25). Plymouth, Devon, 292, 426, 502 (2), 1029 (8):p. 556. -, White Friars (supp. ), p. 556. -, priory (supp.) of, pp. 544, 559, 5623. -, -, pension list, p. 544. -, -, prior. 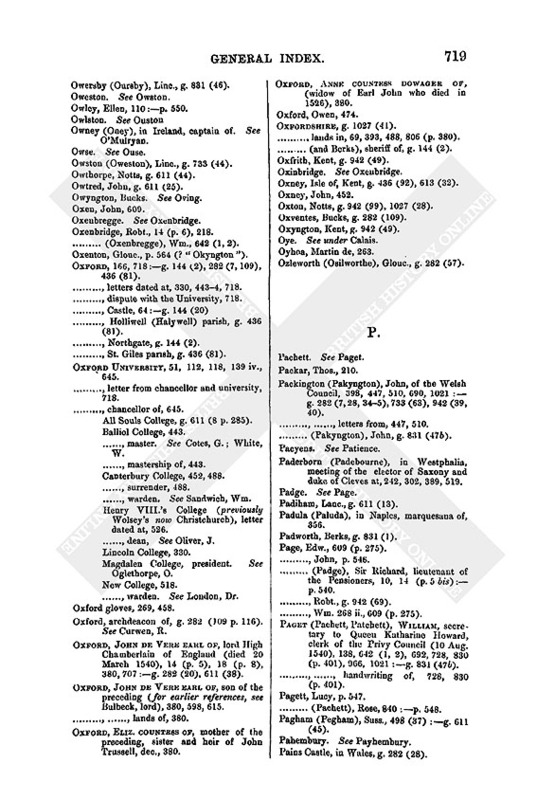 See Howe, J.
Pocock (Pockocke), , of Southampton, 426. Poden (Powden), Worc., near Church Honeyborne, g. 436 (48). Poggio, Giovanni, nuncio with Charles V., afterwards (in Jan. 1552) cardinal, 40, 304, 478 (p. 200), 583, 794, 807, 837 (p. 414), 886, 888, 981, 1017. -, -, letters from, 807, 888, 981. Poland (Polone, Polonie), 320, 457 (p. 189), 530 (p. 237). -, envoy to England, 817, 848, 889 (p. 443). Pole (Poole), Sir Geoffrey, youngest son of the countess of Salisbury, brother of Cardinal Pole, 681. 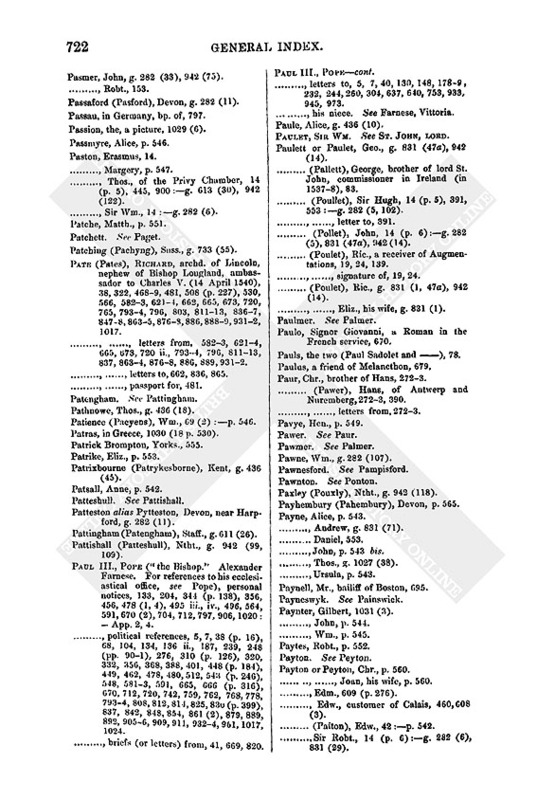 Pole (Poole, Polle), Reginald, Cardinal, son of the countess of Salisbury, and brother of lord Montague, 38, 46, 78, 132, 187, 204, 304, 397, 478 (1, 4), 487, 4956, 498 (58), 507 (2), 547, 564, 692, 697 (pp. 3256), 721, 728, 747, 830 (p. 398), 939 (p. 465):App. 4, 5. -, -, letters from, 204:App. 4, 5. -, -, letters to, 78, 187, 397, 564. -, -, his nephew. See Pole, Henry. -, -, reported appointment as legate of Bologna, 46. Pole (Poule), Mr., 445 (p. 183). -, (Poole, Polle), , of Calais, 270, 1030 (33). -, (Poole), David, LL.D., archd. of Salop, vicar general to bp. Rowland Lee, 8601, 921, 1029 (66). -, -, signature of, 861 bis. -, (Poole), Fras., p. 566:g. 613 (27). -, German, g. 613 (27). -, Giles, 14 (p. 5). -, (Poole), Sir Hen., of the Order of St. John, commander of Dalby, and Rothley, letter to, 520. -, Henry, son of lord Montague, and nephew of Cardinal Pole, prisoner in the Tower, 487, 498 (p. 217). -, (Poole), Leonard, g. 282 (35). -, (Poole), Ric., 51:p. 548. -, Robt., mayor of Gloucester, g. 1027 (38). 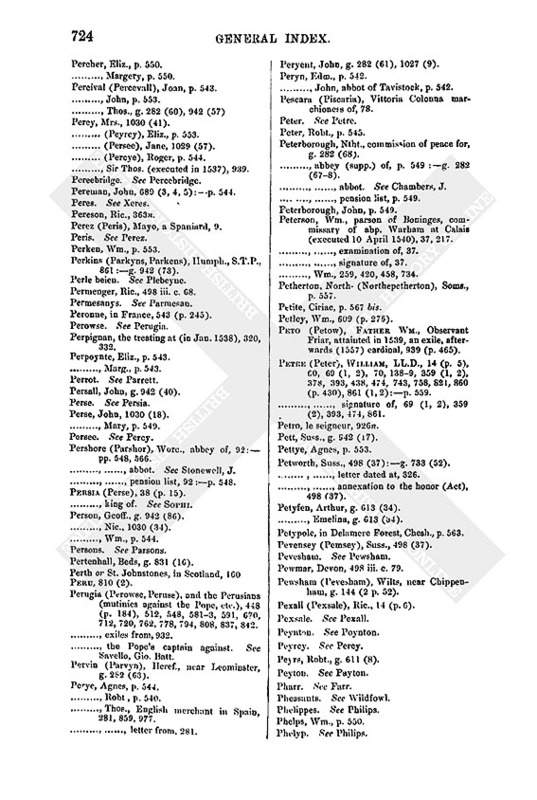 -, (Poole), Robt., collector of quit rents of Calais, 608 (3), 609 (p. 275). -, (Poole), Walter, 609 (p. 275). -, (Poole), Wm., of Calais, 608 (4 iii. ), 609 (p. 275). Poleclose, Heref., g. 282 (125). Polehayes, Devon (near Otterton? ), g. 282 (11). Polesworth (Pollesworth), Warw., p. 559. -, nunnery (supp.) of, p. 559. Poletensis, John. See Stonewell, J.
Politensis, bp. of. See Stonewell, J.
Pollard (Polard), Richard, King's remembrancer of the Exchequer, one of the General Surveyors, 14 (p. 5), 307, 6067, 650 (2), 719, 809 (p. 383), 1029 (9):p. 559 bis:g. 282 (5, 33), 436 (38), 831 (47b, 68), 942 (75). Pollard, Geo., pp. 561, 563. -, Sir Hugh, brother of Richard, 292. -, -, signature of, 292. -, John, clk., g. 282 (103). -, John, g. 282 (33), 831 (12, 57), 942 (75). Polleflatte, co. Denbigh, g. 282 (43). Polles Crosse. See under London. Pollicott (Polycott), Bucks, near Ashendon, 1030 (31). Pollinchone, in Flanders, letter dated at, 201. Pollyngton, Thos., mayor of Wallingford, g. 611 (29). Polmorth, Robt., g. 942 (95). Polslowe (Polslo) or Polleshoo priory (supp.) beside Exeter, p. 544:g. 436 (60, 69). -, pension list, p. 544. -, prioress of. See Sydenham, E.
Polsted, Hen., Cromwell's servant, 1029 (50):g. 282 (89), 1027 (43). -, -, Alice, his wife, g. 282 (89). -, Thos., g. 1027 (15). Poncherton, Baldwin, 609 (p. 275). Pondremy. See Pont de Remi. Pont a Mousson, Francis marquis of, son of Anthony duke of Lorraine, 267. -, -, his betrothal to Anne of Cleves, 267, 8214, 828, 850 (3, 4, 10), 860 (p. 430), 861 (2), 870 (p. 436), 901, 909, 970. See also Anne of Cleves. Pont de l'Arche, in France, 543. Pont de Remi (Pondremy), in France, 126, 429. -, -, letters dated at, 29, 194. Pontefract or Pomfret, Yorks., castle, 196:p. 554. -, -, free chapel and prebend in, p. 554. -, priory or abbey (supp.) of, p. 554. 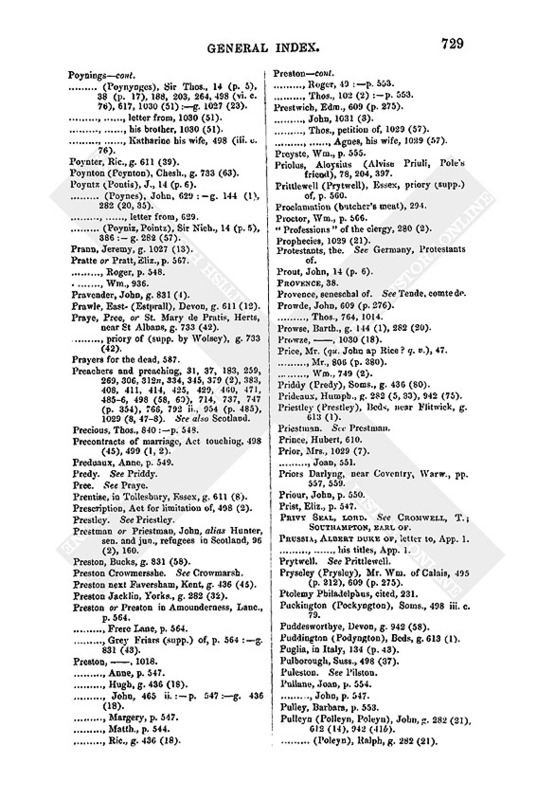 -, -, pension list, p. 554. -, -, prior. See Thwaites, J.
Pontefract (Pomfret), Wm., g. 282 (38). Pontesdowne, in Sidmonton, Hants, g. 611 (43). Ponton (Pawnton), Great-, Linc., g. 611 (41). Poole, Kent, g. 942 (49). Poore, Robt., his debts, 1029 (56). Poorstock (Powrestoke), Dors., g. 144 (2). Pope, the, or Bishop of Rome, Faith, Holy See, Papists, Apostolic See (for personal and political references, see Paul III. ), 37, 38 (p. 16), 64, 82, 114, 125, 136 (p. 44), 217 (pp. 767), 224, 239, 244, 248 (pp. 89, 90, 92), 269, 310, 337, 344 (p. 138), 383, 401, 451, 457 (p. 189), 485, 495, 498 (58), 502 (1, 2), 519, 530 (p. 237), 665, 670 (2), 692, 697 (pp. 3256), 714, 7367, 787, 830 (pp. 398, 401), 850 (10), 870 (p. 436), 879, 888, 901 (p. 447), 909, 938, 953, 977, 1005, 1029 (21). -, -, erasing his name (under the proclamation of 9 June 1535), 395, 619, 633. 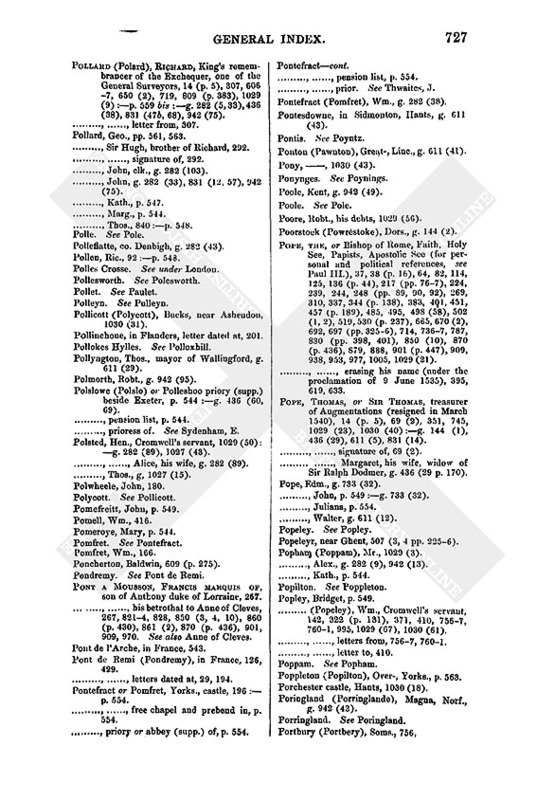 Pope, Thomas, or Sir Thomas, treasurer of Augmentations (resigned in March 1540), 14 (p. 5), 69 (2), 351, 745, 1029 (23), 1030 (40):g. 144 (1), 436 (29), 611 (5), 831 (14). -, -, signature of, 69 (2). -, -, Margaret, his wife, widow of Sir Ralph Dodmer, g. 436 (29 p. 170). Pope, Edm., g. 733 (32). -, John, p. 549:g. 733 (32). -, Walter, g. 611 (12). Popeleyr, near Ghent, 507 (3, 4 pp. 2256). Popham (Poppam), Mr., 1029 (3). -, Alex., g. 282 (9), 942 (13). -, (Popeley), Wm., Cromwell's servant, 142, 322 (p. 131), 371, 410, 7567, 7601, 995, 1029 (67), 1030 (61). -, -, letters from, 7567, 7601. -, -, letter to, 410. Poppleton (Popilton), Over-, Yorks., p. 563. Porchester castle, Hants, 1030 (18). Poringland (Porringlande), Magna, Norf., g. 942 (43). Porte, Sir John, justice (died March 1540), 308, 398:g. 144 (20), 282 (7, 28, 345, 105). -, John, g. 144 (20). Porteman, Wm., g. 282 (5). -, Arthur, 14 (p. 6):p. 539:g. 282 (35), 1027 (38). -, Geoff., g. 436 (18). -, Hen., 609 (p. 275):pp. 557 bis, 559. -, John, 1031 (3):g. 282 (9), 942 (13). Porthlooe (Portloo), Cornw., 498 (34). Portier, Guillaume, 192, 1030 (16). Portinari, John, 14 (p. 5), 412, 415. -, -, letter from, 415. Portland, Dors., 502 (2):g. 144 (2 p. 52). Portland (Porttlond), Walter, pursuivant, 1029 (8), 1030 (18 p. 529). Portlester, co. Meath, g. 942 (65). Portman, Wm., g. 282 (9). -, Wm., Serjeant at law, g. 942 (13). Port O'Neil. See Narrow Water. Portslade (Portyslade), Suss., g. 282 (58). Portsmouth, Hants, 311, 3234, 438 (2), 1030 (18). -, St. Nicholas hospital, 743. -, -, master. See Incent, J.
Portugal, and the Portuguese (Portygalles), 38, 239, 457 (p. 189), 779, 916, 928. -, ambassador of Charles V. See Sarmiento, L.
-, Cardinal of. See Alphonso. -, Infanta of. See Mary. Portuguese (Portingalles), in England, 417. 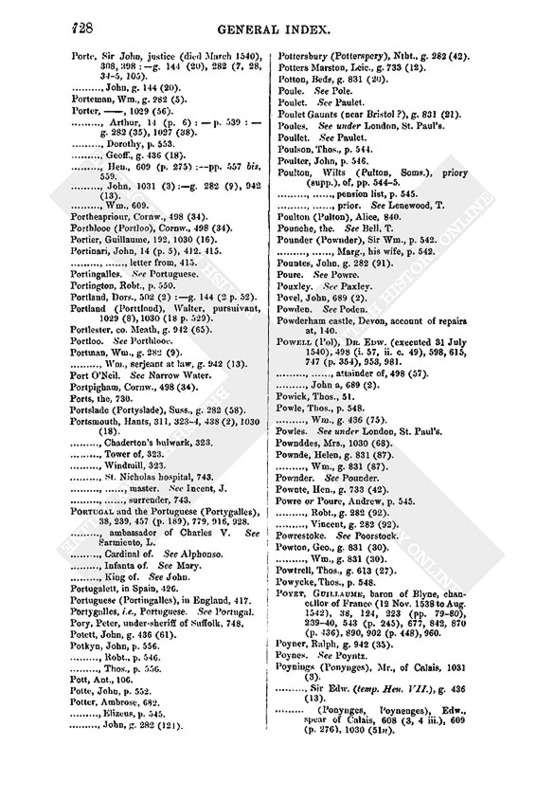 Portygalles, i.e., Portuguese. See Portugal. Pory, Peter, under-sheriff of Suffolk, 748. Potett, John, g. 436 (61). -, John, g. 282 (121). Pottersbury (Potterspery), Ntht., g. 282 (42). Potters Marston, Leic., g. 733 (12). Potton, Beds, g. 831 (20). Poulet Gaunts (near Bristol? ), g. 831 (21). Poules. See under London, St. Paul's. Poulton, Wilts (Pulton, Soms. ), priory (supp. ), of, pp. 5445. -, -, pension list, p. 545. -, -, prior. See Lenewood, T.
Pounche, the. See Bell, T.
Pounder (Pownder), Sir Wm., p. 542. -, -, Marg., his wife, p. 542. Pountes, John. g. 282 (91). Powderham castle, Devon, account of repairs at, 140. Powell (Pol), Dr. Edw. (executed 31 July 1540), 498 (i. 57, ii. c. 49), 598, 615, 747 (p. 354), 953, 981. -, -, attainder of, 498 (57). -, John a, 689 (2). -, Wm., g. 436 (75). Powles. See under London, St. Paul's. Pownde, Helen, g. 831 (87). -, Wm., g. 831 (87). Pownte, Hen., g. 733 (42). Powre or Poure, Andrew, p. 545. -, Robt., g. 282 (92). -, Vincent, g. 282 (92). Powton, Geo., g. 831 (30). -, Wm., g. 831 (30). Powtrell, Thos., g. 613 (27). Poyet, Guillaume, baron of Blyne, chancellor of France (12 Nov. 1538 to Aug. 1542), 38, 124, 223 (pp. 7980), 23940, 543 (p. 245), 677, 842, 870 (p. 436), 890, 902 (p. 448), 960. Poyner, Ralph, g. 942 (35). Poynings (Ponynges), Mr., of Calais, 1031 (3). -, Sir Edw. (temp. Hen. VII. ), g. 436 (13). -, (Ponynges, Poynenges), Edw., spear of Calais, 608 (3, 4 iii. ), 609 (p. 276), 1030 (51n). 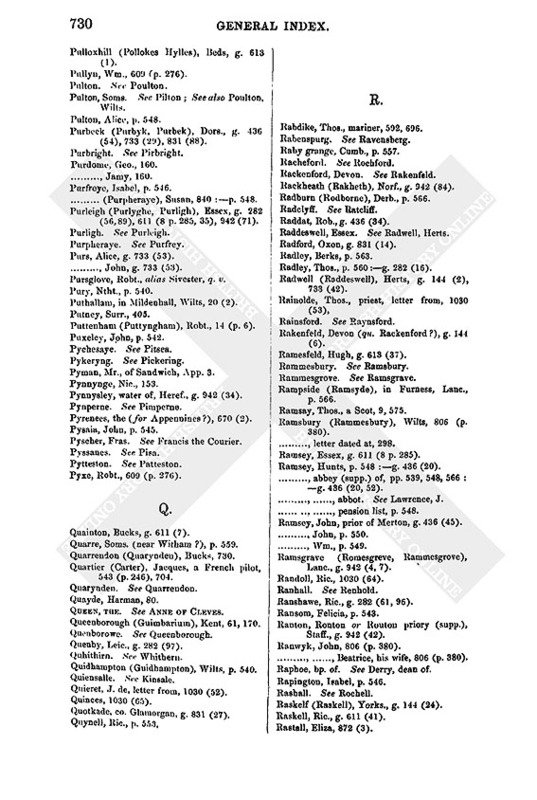 -, (Poynynges), Sir Thos., 14 (p. 5), 38 (p. 17), 188, 203, 264, 498 (vi. c. 76), 617, 1030 (51):g. 1027 (23). -, -, letter from, 1030 (51). -, -, his brother, 1030 (51). -, -, Katharine his wife, 498 (iii. c. 76). Poynter, Ric., g. 611 (39). Poynton (Peynton), Chesh., g. 733 (63). Poyntz (Pontis), J., 14 (p. 6). -, (Poynes), John, 629:g. 144 (1), 282 (20, 35). -, -, letter from, 629. -, (Poyniz, Pointz), Sir Nich., 14 (p. 5), 386:g. 282 (57). Prann, Jeremy, g. 1027 (13). Pratte or Pratt, Eliz., p. 567. Pravender, John, g. 831 (4). Prawle, East- (Estprall), Devon, g. 611 (12). Praye, Pree, or St. Mary de Pratis, Herts, near St Albans, g. 733 (42). -, priory of (supp. by Wolsey), g. 733 (42). Prayers for the dead, 587. Preachers and preaching, 31, 37, 183, 259, 269, 306, 312n, 334, 345, 379 (2), 383, 408, 411, 414, 425, 429, 400, 471, 4856, 498 (58, 60), 714, 737, 747 (p. 354), 766, 792 ii., 954 (p. 485), 1029 (8, 478). See also Scotland. Precontracts of marriage, Act touching, 498 (45), 499 (1, 2). Prentise, in Tollesbury, Essex, g. 611 (8). Prescription, Act for limitation of, 498 (2). Prestman or Priestman, John, alias Hunter, sen. and jun., refugees in Scotland, 96 (2), 160. Preston, Bucks, g. 831 (58). Preston next Faversham, Kent, g. 436 (45). Preston Jacklin, Yorks., g. 282 (32). Preston or Preston in Amounderness, Lanc., p. 564. -, Frere Lane., p. 564. -, Grey Friars (supp.) of, p. 564:g. 831 (43). -, Hugh, g. 436 (18). -, John, 465 ii.:p. 547:g. 436 (18). -, Ric., g. 436 (18). -, Thos., 102 (2):p. 553. Prestwich, Edm., 609 (p. 275). -, Thos., petition of, 1029 (57). -, -, Agnes, his wife, 1029 (57). Priolus, Aloysius (Alvise Priuli, Pole's friend), 78, 204, 397. Prittlewell (Prytwell), Essex, priory (supp.) of, p. 560. Professions of the clergy, 280 (2). Protestants, the. See Germany, Protestants of. Prout, John, 14 (p. 6). Provence, seneschal of. See Tende, comte de. Prowde, John, 609 (p. 276). Prowse, Barth., g. 144 (1), 282 (20). Price, Mr. (qu. John ap Rice? q. v.), 47. -, Mr., 806 (p. 380). Priddy (Predy), Soms., g. 436 (80). Prideaux, Humph., g. 282 (5, 33), 942 (75). Priestley (Prestley), Beds, near Flitwick, g. 613 (1). Priors Darlyng, near Coventry, Warw., pp. 557, 559. Privy Seal, lord. See Cromwell, T.; Southampton, earl of. Prussia, Albert duke of, letter to, App. 1. -, -, his titles, App. 1. Pryseley (Prysley), Mr. Wm. of Calais, 495 (p. 212), 609 (p. 275). Puckington (Pockyngton), Soms., 498 iii. c. 79. Puddesworthye, Devon, g. 942 (58). Puddington (Podyngton), Beds, g. 613 (1). Puglia, in Italy, 134 (p. 43). Pulleyn (Polleyn, Poleyn), John, g. 282 (21), 612 (14), 942 (41b). -, (Poleyn), Ralph, g. 282 (21). Pulloxhill (Pollokes Hylles), Beds, g. 613 (1). Pullyn, Wm., 609 (p. 276). Pulton, Soms. See Pilton; See also Poulton, Wilts. Purbeck (Purbyk, Purbek), Dors., g. 436 (54), 733 (29), 831 (88). -, (Purpheraye), Susan, 840:p. 548. Purleigh (Purlyghe, Purligh), Essex, g. 282 (56, 89), 611 (8 p. 285, 35), 942 (71). Purs, Alice, g. 733 (53). -, John, g. 733 (53). Pursglove, Robt., alias Sivester, q. v.
Puthallam, in Mildenhall, Wilts, 20 (2). Puttenham (Puttyngham), Robt., 14 (p. 6). Pyman, Mr., of Sandwich, App. 3. Pynnysley, water of, Heref., g. 942 (34). Pyrenees, the (for Appennines? ), 670 (2). Pyscher, Fras. See Francis the Courier. Pyxe, Robt., 609 (p. 276).